Is Theresa May schizophrenic? That’s certainly one interpretation of her attitude to the British border in Ireland. 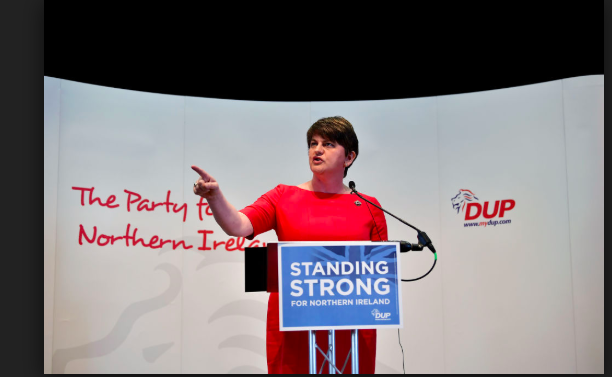 In December of last year, she and her government agreed with the EU on the now-famous backstop. This said that, if no other solution was agreed for the border, the north would effectively remain in the EU customs union. In this way there’d be hard border in Ireland. In February of this year the EU tried to put this agreement into legal form in its draft Withdrawal Treaty. In it, the north would effectively stay in the customs union. May then declared this to be a threat to the UK constitutional integrity. So what she agreed to in December, without a blush she rejected vigorously in March of this year. But maybe she realized what she’d agreed to. After all, a person can change their mind. That’s not the same as lying or going back on your word, is it? Well yes, it is. Clearly she’s been levered by the DUP into this rejection of the backstop which would solve the British border in Ireland question. They don’t want to feel they’re being sawn off and linked with the south of Ireland/the EU, rather than remain an integral part of the UK. You can’t blame for that, can you? After all, they are unionists. Well yes, you can blame them. I can, you can and the world can blame the DUP and their eternal fears. Because in all the backstop debate and the perils of an economic border in the Irish Sea, everyone appears to have forgotten what the Good Friday Agreement had to say about the British border in Ireland. It says that the north is part of the UK and will so remain until a majority of people in the north and in the south of Ireland express a wish for a change. It’s true that the DUP didn’t sign the Good Friday Agreement, but it’s also true that they can read. The backstop is an ECONOMIC agreement, to effectively keep the north in the EU. Yes, that’d be different from the rest of the UK, but there are precedents for such an arrangement. To take just one: EU law doesn’t apply in the same way to French Overseas Territories as it does to France itself – but there is no suggestion that this diminishes France’s sovereignty over these Territories. What it comes down to is that old ghost, unionist fears. Since the inception of the state 100 years ago, unionists have lived with the uneasy awareness that the state they have created is a sad, deformed creature and is constantly subject to pressures that could be fatal. Unionists also have always been suspicious of British governments: remember, they created the northern state by initially defying the British government over Home Rule. They’re like the cat that got burnt by a hot stove: even when it’s clear that the stove is stone cold, the cat keeps well away from it. Even the fact that the future of the north is being left to the wishes of the majority in it – and to the people of the south – as to whether the north remains part of the UK – even that is not enough. Unionism, in creating the northern state, defied British democracy. It has now reached the point where it is terrified of democracy even within its own tormented borders. The backstop simply ratchets up that terror, and that’s why Theresa May who, God help her, needs the DUP, has gone back on her word of December 2017. Rewriting history? Somebody’s got to do it.